The Most Affordable Solid Wood Construction Full Sized Martin Guitar. The Martin D 15 guitar is a wonderful, affordable, and heirloom quality instrument. If you've been following any of my other acoustic guitar reviews here on hubpages, or even if you are a random web shopper, reading about guitars - and you've come to the right place, then maybe you've realized that Martin guitars, especially Martin guitars that have a "D" in their title, are often very expensive instruments. Not so with the Martin D 15 guitar. This may be the best deal in acoustic guitars anywhere in this world. This is a great guitar, an amazing guitar for the price in both playability, resale value, long term value, and tonality. What makes this guitar what it is is the fact that it is a guitar featuring all solid wood construction, and in this case, the wood is mahogany; and it's also a guitar manufactured by the legendary American Guitar Company, C.F. Martin & Co. The All Mahogany D 15 Flat Top by C.F. Martin & Co. The D 15 with Case. What makes the Martin D 15 guitar have so much value for the price is that it's one of the rare guitars made with a mahogany top. You can find a lot of manufacturers making such guitars, but very few of those others will have a manufacturer name that carries the value of Martin, nor will they have the quality construction, lifetime warranty for the original owner, playability, and sense of pride that comes with owning a Martin Guitar. The Beauty of solid mahogany. Solid spruce soundboards are the norm for Martin "D" guitars, and most anyone who makes a guitar in the style of the Martin "D" guitars. Solid spruce soundboards, however, are a pricey thing. Should you go all out and purchase a guitar with a "red" Adirondack spruce soundboard, then you may well spend enough money for that specification to have bought you SIX Martin D 15 guitars. I found two prices, and three online vendors for this outstanding guitar by the legendary C.F. Martin & Co. 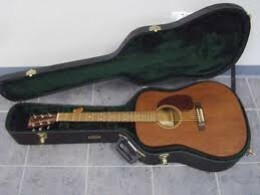 The Martin D 15 guitar is a very valuable instrument for the price. It's practically a steal. The thing with the all mahogany guitar is that it will not produce the same sort of tone that a guitar with a spruce soundboard, or even a guitar with a cedar soundboard. The mahogany soundboard of the D 15, however, can be amplified to the desired level with a little bit of adjustment. If someone bought one of these guitars and then had a bone nut, saddle, and bridge pins installed instead of the factory pieces - this guitar would become louder simply from using bone over the high grade plastic that Martin is using. Add a nice pickup to the guitar - and if you play live in front of an audience - then it never much mattered that the mahogany soundboard has less volume than spruce soundboards unplugged.